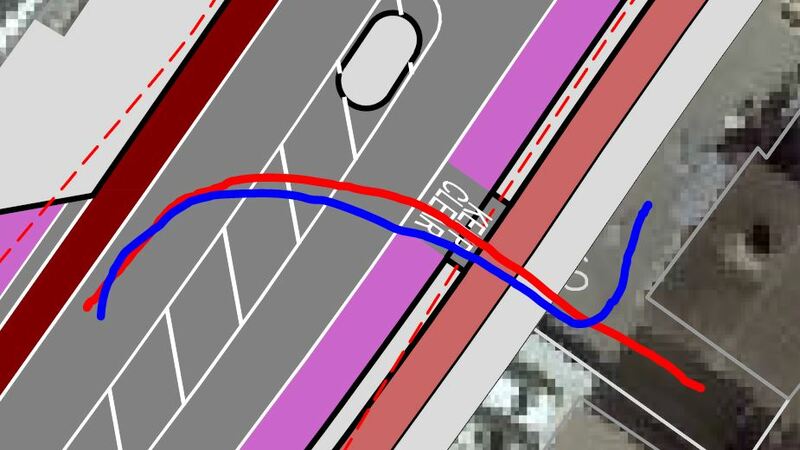 COMMENT & ANALYSIS: Owners of shops around the world often object to cycle paths and other street layout changes and we expected the same would happen in Waterford after reporting major changes planned for that city. One retailer who is claiming that their business will be destroyed is Dunphy’s Castle Shop on the Cork in Waterford. One of the family members who run the business took to Liveline on RTE Radio 1 last Wednesday. The representative from Dunphy’s was only identified as Cora (so, breaking from our normal style we’ll use her first name). Dunphy’s sounds like a solid family run shop. It’s the kind of shop which done well in successfully holding their own against multinational retailers and Irish-owned chain stores (there’s one located just across the street from them). The process of that success, however, may have also created a bunker mentality which makes them more sharply against change compared to the average retailer. And the average retailer seems to be usually against changed. Objecting to other local businesses and then using such local businesses as an excuse not to put in a cycle path makes Dunphy’s seem like serial objectors. On Liveline, the Cork Road was referred to as the N25, but it’s no longer that route since the route number was given over to the Waterford bypass when it opened 6 years ago. It seems like they might have been the kind of business which might have objected to the bypass because of its affect on “passing trade”. Outside Dunphy’s is ‘forecourt’, where they sell solid fuel in the winter and children’s buckets and spades in the summer. They also use the space for table and chairs. The council, however, are not planning to do any such thing. What about parking? Below is a photograph of Dunphy’s as can be viewed on Google Street View. Very little of the current parking seems to be legal. Two of the cars above are pictured parking on the public footpath: The plans include around 15 public parking spaces close to the shop, and the vast bulk of those are on the same side as the shop. That’s far more legal parking spaces than what’s currently available on the street. For some reason Cora only thinks of mentioning the three spaces outside her shop. And Cora said: “That parking has to be shared by everyone [as in every business on the road” — this however is also not correct. As shown by the first images above, there’s a huge amount of off-street parking which services many of the businesses on the road. The 15 or so spaces are shared by only a small number of businesses. The changes planned are being provided in line with local, regional and national policy which seeks to tackle congestion, health issues, and climate change. Providing safe cycling routes is one part of that. It includes making cycling safe and attractive to all. But when asked about providing safe cycling for students traveling to Waterford IT which is down the road, Cora, said: “WIT is just down from us but it is so close you would not need to cycle, you can walk.” So, she wants students traveling from all over the city to walk and not have the option of cycling? She adds that students in student accommodation are also transported on buses out to the IT. People who cycle will be able to stop at her shop, people who get the bus will likely not, unless they are getting off at a local bus stop. The ‘I’m a cyclists’ defence was also used. She said: “I cycle. I’ve cycled around Ireland with my boyfriend, who is now my husband, 20 years ago. I love cycling, I have a bike myself and I get out [on it].” A rare cycle around the country 20 years ago is another world to the type of cycling which is trying to be promoted. The plans by the council are a strong step towards everyday cycling — where people cycle to work, school, college and their local shops every day. Cora said: “We depend on traffic for business. I’d say 70% of our business is traffic.” Not seeing bicycles as traffic shows the shop owner’s mindset. From surveys around the world, we know that (a) retailers overestimate how many people travel by car and (b) that protected bicycle paths, like the ones planned outside Dunphy’s, are good for local retailers. But Cora did not stop there. She also claimed that the changes would affect her mother, who she said has a disability and needs to drive right up to the door, and that access to their yard behind the shop and house would be blocked. 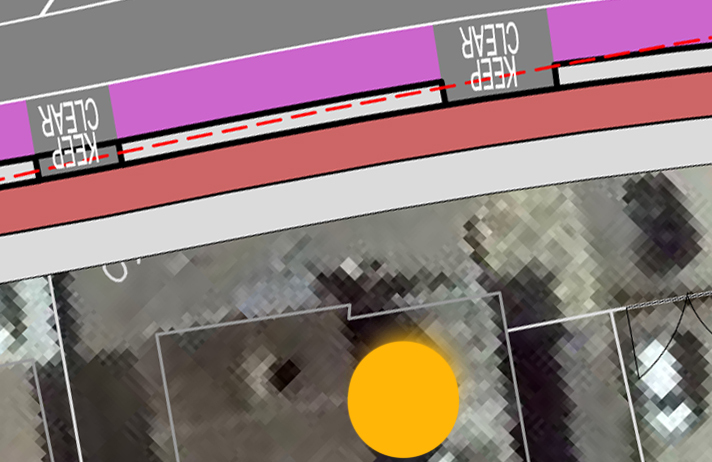 The drawings, however, again show how access the front of the house and the rear yard is not blocked. 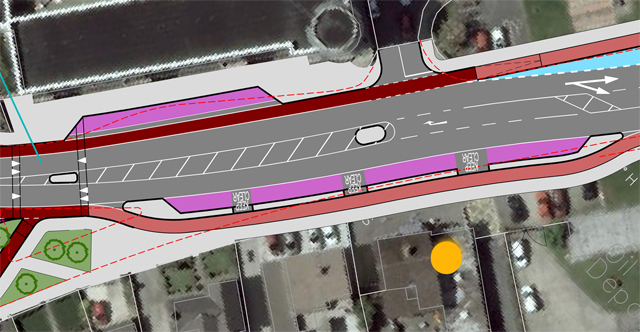 It might, at worst, cause some inconvenience, but the layout and central island are high unlikely to block anything, as was claimed on Liveline. She also complains that there’s no reasoning for a planned one-way system between her shop and the city centre. There is however very clear reasoning: It is to give sustainable modes of transport safe space, walking and cycling is provided for in both directions on the small one-way loop. That loop is unlikely to unduly affect motorists using the route. The impression that consultation is over or is not happening was also given on Liveline. Official consultation however is still open. Waterford City and County Council is open to submission and or observations in writing, to The Director of Services, Economic Development and Planning Services, Waterford City & County Council, c/o Mr. R. Maddock, Menapia Building, The Mall, Waterford before 4pm on August 11, 2015. As we said, Cora complains that she will be just dismissed and her business will be ruined. Valid concerns should not be dismissed and the council should not dismiss people who may suffer because of the plans. But, for concerns to be more than just unfounded fears, those concerns must be based on facts, not misunderstandings of the plans. If she wants to attract more customers she should put in at least 10 Sheffield Stands outside her shop. Cyclists will be hesitant to stop if no secure parking. She has an Ice cream sign and she sells Buckets and spades which means her clientele are a lot of Children and Mothers which means lots of people on Bikes buying stuff . It seems to be a very local area which means lots of Cyclists and Pedestrians using her Shop and not Car drivers unless they are buying Bottled Gas or Briquettes. You say it is on the N25 which means that most of the Traffic is just Bypassing the area to go somewhere else. So in reality most of her Trade is people on foot or on Bicycles. I see no problems with the Layout Cars are catered for, she seems to be protesting to much. To be clear: It’s not on the N25 anymore. That name was given to the bypass when it opened. And to be fair to the shop, beach goers will likely need car parking as the beach is some distance away!